A 400 Pontiac block Block will be bored and plate honed accordingly "painted color of choice"
Our modified crate engines feature ported and polished aluminum heads, aluminum intake, chrome package (oil pan, dipstick, thermostat housing, air cleaner, timing cover, valve covers, breather) completely balanced rotating assemblies, aluminum rockers, high performance pistons, edelbrock or Holley carburetor (with electric choke), stainless steel modified valves, starter and flex plate. Stage Four and Stage Five engines require a high torque starter. We can supply one for you for 225.00 extra. We can also include the March Performance serpentine belt system for alternator, power steering and ac for 1870.00 extra (depending on what your externals are). Eddies understands that every customer wants choices. This is why Eddies offers our customers the option of having their crate engine built with our aluminum products in the traditional as-cast finish or with a show-quality polished finish. Order the "Polished Package" and you'll get an engine with exterior polished heads, intake manifold and water pump if applicable. All Eddies Performance crate engines come with a 12 month, unlimited mileage warranty. With this exclusive crate engine warranty, you get classic Eddies performance crate engine backed by a proven warranty for complete peace of mind. 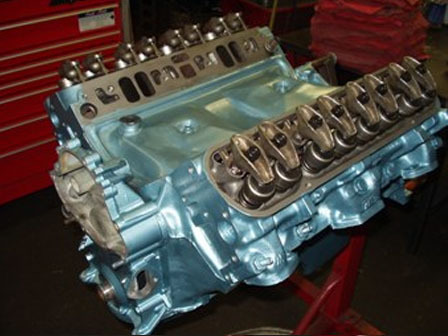 If your vehicle is a muscle car, classic car, street car or race car, Eddies will help design and build the you the best crate engine combination that suits your vehicles needs. Please browse our engine combinations listed above or custom design one of your own and if you need help we will always assist you. So if you are looking for that specially built stroker engine or that turn-key drop in ready crate engines, call Eddie at 800-471-2325 and we will be happy to answer any of your questions.